Used 40ft Office cabin available from Pune , size 40x8x8.5 ft with light , fan, A/C points , 6 windows and 1 door , hardly used for 2 months. Our company is the leading company known for providing Site Office Container to the clients. This product is highly applauded for their aesthetic designs, robust construction and others. Site Office Container is checked on different parameters to ensure flawlessness. We are offering it at affordable rates to our customers. We have emerged into the business of procurement and supply of used shipping containers for both store and office purposes. We are in a position to modify the container according to your choice at a very competitive cost for Site Office, Bunks and Storage purpose. 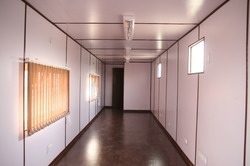 We are providing containerized office space and house space. For site office, farm house, picnic shelter, construction site office, out house, ready made office etc suitable for remote area, temporary office, any work site, portable, quick setup, outdoor shooting change room, relax room. Available for office, Labour Room, Trading .